muffins | Grow. Cook. Read. Write. If my husband was forced to choose between maple syrup and bacon, he would probably choose to lie down on the floor and quietly, sadly expire. Beer should probably also be included. While I wouldn’t miss beer quite as much as he would, I can say that the maple and bacon conundrum would be an issue for me, too. The combination of maple, bacon, and pecans is one that I try to work into our meals as often as is reasonably possible, though the three don’t always show up in the same recipe. One favorite is blueberry-pecan pancakes with maple syrup and bacon on the side for breakfast. You can imagine how intrigued I was when I read in the March issue of Everyday with Rachael Ray about their maple bacon muffin idea. Unfortunately, the basic muffin mix in the magazine called for vegetable oil, and I don’t love vegetable oil in baked goods. Olive oil is the one exception, and then only in very particular applications (like a citrus loaf cake in Melissa Clark’s book In the Kitchen with a Good Appetite–in that application, it’s absolutely wonderful…or in Clothilde Dusoliers’ olive oil tart crust, also wonderful). 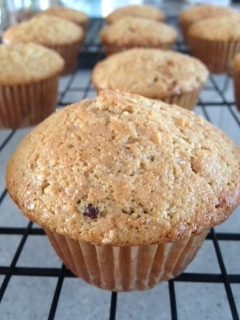 But the idea of the muffins wouldn’t go away, so I looked online for a basic muffin recipe, and found it at King Arthur Flour. It’s very simple, with all-purpose flour, sugar, eggs, leavening, milk, and oil or butter–dealer’s choice. To make myself feel less guilty about the maple and bacon, I decided to do some swapping on the flour front. I used a mix of white whole wheat and whole wheat pastry flour, swapped some of the granulated sugar out for maple sugar, and used buttermilk instead of milk. I also upped the buttermilk and butter some, to add a little more moisture for the whole wheat flours. The resulting muffins didn’t dome much, but they’re moist, savory-sweet, and sitting on the counter calling my name. Two of them have mysteriously disappeared already. 1. Preheat oven to 500. Line a 12 cup muffin tin with liners, or spray with cooking spray. 2. In a large mixing bowl, measure out the flours, sugars, baking powder, baking soda, and salt. Whisk to combine. 3. In a medium bowl (or 4 cup liquid measure, which makes one less dirty dish) measure out the buttermilk and then whisk in the butter, eggs, and maple syrup. Pour the liquid mixture into the dry mixture, and stir one or two times around the bowl. 4. Add the pecans and bacon and stir into the batter, stirring only until just combined. It’s okay to have some small streaks of flour still showing. You don’t want to over-stir, or the muffins can become tough. 5. Scoop batter into muffin tin, filling just below the rim of the liner or tin. Sprinkle maple sugar on the top of each muffin. Place in oven and reduce heat to 400 (the initial blast of heat helps give them some lift, according to the King Arthur Flour recipe). 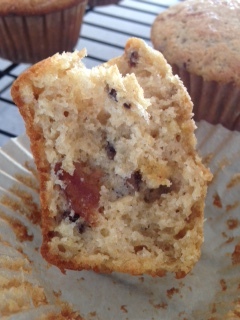 Bake 15-20 minutes, or until a tester inserted into a muffin comes out clean. These took 16 minutes in my gas oven. This entry was posted in Cooking and tagged bacon, cook, maple, muffins on February 18, 2015 by titang0415.